Is My Expensive Vitamin C Serum Killing My Skin? In this era of profits- over-people, it’s become a health hazard not to closely examine the ingredients found in skin care products. This is particularly true if you’re using an expensive vitamin C serum or cream because the adage “you get what you pay for” tends to make us more trusting than warranted of marketing claims wrapped in fancy packages. While vitamin C is the indisputable champion of anti-aging therapies, most of the vitamin C you’ll find in skin care formulations is a contorted version of the pure active. Many of these derivatives are harmful and found in serums that sell for well over $125 an ounce. Learn about these derivatives to safeguard both face and wallet. Vitamin C enables every step of collagen production from stem cell activity to the structural integrity of the skin matrix. 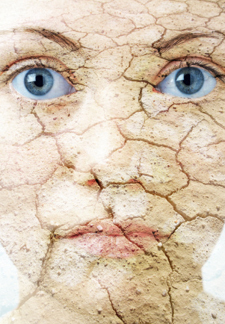 Women experience a loss of collagen integrity and production due to fluctuating estrogen levels (Pugliese 2009). Skin levels of vitamin C drop 425% by the time a person reaches middle age (Shindo 1994). The only way to increase skin levels is to apply vitamin C topically (Levine 2001). It’s no coincidence that vitamin C skin levels drop precipitously over time, and that the signs of skin aging are the same as those associated with damaged collagen and loss of collagen production. The good news is that you can readily reverse the signs of skin aging by applying vitamin C topically. But before making a selection of a serum or cream, make sure the type of vitamin C it contains is safe and effective. If you don’t check first, you’re running the risk doing far more damage than good. Read on. The following five types of vitamin C are commonly used in cosmetic formulations today. Make a note of their chemical names and check for them on your product’s ingredient list. If you’re not sure about what your ingredient list means, head over to our Vitamin C and Skin Care Forum and ask! Newcomers are welcome. These are different names for essentially the same derivative of AA formed by adding magnesium phosphate in a process known as esterification. The addition of the phosphate raises the pH level ascorbic acid remains stable in when in solution. Sodium ascorbyl phosphate is another vitamin C derivative synthesized to deliver the same benefit.Ascorbic acid naturally occurs at a pH of around 3.5 which is fairly acidic. Its acidity creates problems in emulsions. Emulsions are carriers like lotions and creams formulated to make products look and feel nice. The addition of a phosphate group to ascorbic acid, whether magnesium or sodium, raises the pH level it can survive in to greater than 7. For the naturalists amongst us, it will come as no surprise that the safest form of vitamin C is ascorbic acid – the form found in nature and biologically active in the body. In 1747 a physician working for the British Royal Navy identified vitamin C as a mysterious compound in citrus fruit that cures scurvy. In 1931 a Hungarian scientist isolated the compound and called it hexuronic acid. The name ascorbic acid was later proposed and adopted to acknowledge its anti-scorbutic (scurvy) properties. Through common usage, the term “vitamin C” became a categorical name applied to ascorbic acid and its many derivatives. As a dietary supplement, the base ascorbic acid molecule is modified in a variety of ways to either enhance intestinal absorption or reduce its natural acidity. As a topical skin care ingredient, the base molecule is modified to boost its stability and help it penetrate the top layer of the skin. Whether in the form of a dietary supplement or as an ingredient in a skin serum, the biologically active component of any vitamin C derivative is ascorbic acid. Thus the vitamin C compound must be degraded in the skin or in the body so that free form ascorbic acid is released (Humbert 2003). 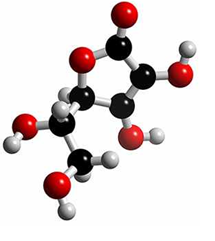 Ascorbic acid is made of only three elements: six carbons (black), eight hydrogens (white), and six oxygens (red). Any vitamin C derivative must release ascorbic acid in its naturally occurring structure if benefits are to be realized. While no one intends to sell dangerous products, recklessness is often the road to ruin. In the world of cosmetics manufacturers, the rush to incorporate vitamin C derivatives into formulas sold as anti-aging serums apparently made safety an ancillary concern. Why investigate and look for trouble? What could go wrong with vitamin C? The poster child for what can go wrong is told in the story of ascorbyl palmitate. Ascorbyl palmitate is a vitamin C derivative formed by adding a fatty acid named palmitic acid to the base ascorbic acid molecule. Fatty acids are building blocks of lipids and palmitic acid is one of the most common. As the name implies, palmitic acid is found in palm trees and coconut oils. Palmitic acid is a common fatty acid found in palm tree oils. Lipids and fatty acids are important in skin care because lipids form a major component of the outer layer of the skin. This poses a problem for ascorbic acid because it’s water soluble making it complicated for manufacturers to ensure it passes through the skin’s lipid barrier. An oil soluble derivative was needed and the food industry had already synthesized an oil soluble version to use as a food preservative. Named ascorbyl palmitate, the compound is made by attaching a palmitic acid molecule to an ascorbic acid molecule. 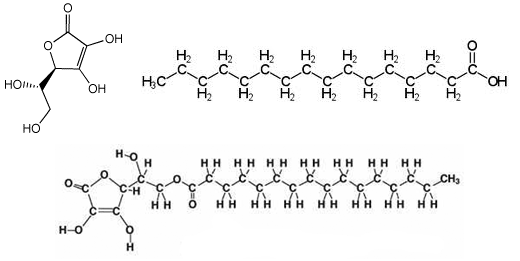 One end of the molecule (the AA end) is water soluble and the other end (palmitic acid) is oil soluble. Ascorbic acid attached to palmitic forms ascorbyl palmitate. A landmark study reported in the Journal of Investigative Dermatology investigated what happens in human skin when ascorbyl palmitate is applied and then exposed to a moderate amount of sunlight – about the same as an average person would be exposed to on a sunny day. The researchers expected ascorbyl palmitate to penetrate the lipid barrier of the skin, but they weren’t sure if it would penetrate the lipid barrier of skin cells. They discovered that it efficiently penetrates both lipid barriers, and that the ascorbic acid very effectively subdued intra-cellular free radical generation. However they were astonished to find out that any gains bought by the ascorbic acid were dramatically outweighed by the pitfalls of the palmitic acid. Their astonishment was apparent in the choice of adjectives they used to describe the havoc. According to the authors, palmitic acid is a lightning rod for UV rays which brought on “catastrophic” skin cell death on a “massive scale.” The authors further warned against using any vitamin C serum with a concentration of ascorbyl palmitate in excess of 100-300 M (micromoles). Distressingly, many cosmetics contain concentrations as high as 15 percent which exceeds the authors’ warning dose by a factor of 1000. The number of cosmetics containing ascorbyl palmitate exceeded 617 in the year 2000, a leap from a year 1992 count of 667 products (Burnnet 2011). Check both your sunscreen and your vitamin C serum for ascorbyl palmitate. The Environmental Working Group is working toward getting the FDA to ban its use in sunscreens. Also check your labels for ascorbyl tretaisopalmitate, tetrahexyldecyl ascorbate and liposome encapsulated vitamin C. If you have questions, hurry over to our Vitamin C and Skin Care Forum. And warn your friends and family – use the share buttons liberally on this post.